BHOPAL: A Muslim officer carrying 'charan paduka'--the symbolic footwear of Adi Shankaracharya, should have led to stories about communal harmony. However, Collector Sufiyah Faruqui's act has drawn comments from Shankaracharya Swaroopanand Saraswati, questioning her intent. This has happened in Mandla district of Madhya Pradesh. 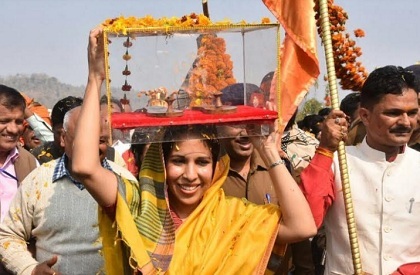 Swaroopanand Saraswati said that if she carried the 'paduka' because of belief, then it was fine but if she had to do it as a Collector, then it is questionable. 'Agar collector hone ke naate karna pada, phir to gadbad hai', he told media. The Ekatm Yatra that began from Amarkantak reached Chabi in Mohgaon block of Mandal. For propagating the message of Adi Shankaracharya and for installation of his 108 feet tall statue, this Yatra is being taken out. As the Yatra arrived, Collector Sufia Farooqui welcomed it. She carried 'charan paduka' on her head and walked. The other public representatives also carried the flag later. Flowers were showered and she carried the flag as well. The Opposition has meanwhile criticised the involvement of government officials in the Yatra. Congress has said that Collectors should remain away from political events. Sufiyah Faruqui who hails from Bhopal, was a UPSC topper. She had attained 20th rank in the examination in the year 2009.